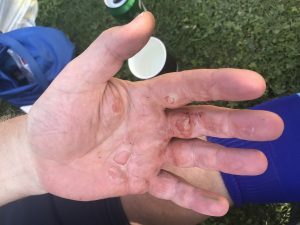 Blistered hands and aching backsides provided the warm glowing feeling that is familiar to all long distance rowers as three Loughborough crews tackled this year’s 21.6 kilometer ‘Great Ouse Marathon’. The now notorious Dr Ferret set off first, with Scott and Mike appropriately attired for a long intergalactic journey, whilst Matannah chased them down remorselessly in their lighter, swifter, and more stylish double act. Very sensibly putting fashion as a priority, Matilada and Hannah stopped to retrieve a sunhat that had blown off due to their great forward speed, costing them precious seconds but still enabling a finishing time of 1 hour 51 minutes, five minutes ahead of Scotty and Mike who were later seen in a huddle trying to spare their blushes by calculating the age handicap that theoretically should be applied between teenagers and quinquagenarians. The dubious product of their sums, a figure in excess of two hours to be subtracted, meant that their Enterprise would actually have finished the race before it ever began, thus proving the existence of black holes and an inverted space time continuum. Whatever. 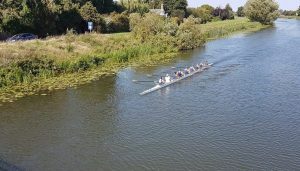 Meanwhile, with Jerry and Sandra hungry for another course record to add to their long standing Mixed Masters D Coxed Four time, and Emily fired up by some highly effective pre-combat exhortation from Major Tim, the Mixed Masters Eight were primed for action. This was Rachel’s first ever long distance race as cox, and she was uncertain whether she should shout at the crew all the way down the course or not. Her dilemma was easily resolved because, in her own words, ‘every time I stopped talking you rowed like sh*t’. The length of the race meant that Rachel had the luxury of being able to dedicate 13.5 minutes of individual ‘encouragement’ to every single rower, a task she accomplished with aplomb even though she was seen to turn slightly pale as Vicky’s blade handle grew steadily more crimson with a viscous mixture of blood, spray, and that mysterious slime that is always left over from red berry energy gels. With Jen at Bow bravely buffering the strong southerly headwind and Charlie rowing one handed so he could wave to any pretty girl he saw on the towpath, ‘Pick and Mix’ made good progress and soon overhauled the Peterborough Eight although a Chesterton crew were gradually catching the Loughborough boat from behind, eventually drawing past in the second half of the course. However, this did not demoralise the LBC team, with rookie Jonathan continuing to power the middle of the boat with the innocence of the uninitiated and Kate perfecting the ‘Henry One Hand’ technique whilst struggling to control that possibly deliberate ‘flyaway hair’ look that you see in shampoo adverts. 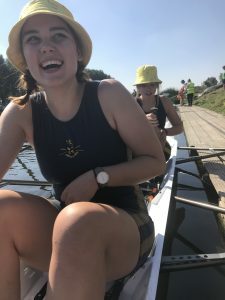 Finally, after averting the coxswain’s attempt to steer the boat up the River Little Ouse (the clue is in the name of the race, Rachel…), the finish line was crossed in 1 hour 48 seconds with much groaning and promising never to do it again….until next year!